Glen Mhor is a closed distillery from the Highlands that is not very well known outside of the geekiest of whisky geek circles. I am quite far from those circles and have little knowledge of this distillery. Indeed, it’s only recently that I learned that the Mhor part of the name is pronounced “Vhar”. Accordingly, I will send you off to Malt Madness to read about it. 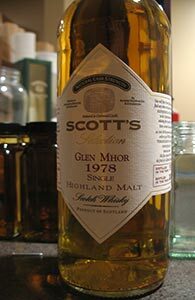 I can also say nothing about my previous experience with Glen Mhor’s whisky as this is my very first encounter with it (there is very little of it on the market, especially in the US). And so I have no preconceived notions about this whisky in general; and as there are no reviews of this particular bottle out there that I can find I have no idea what to expect from it either.